In a major relief to allottees of commercial sites across Haryana, HUDA has relaxed the policy on approval of building plans of clubbed commercial sites. Under the revised norms, the HUDA estate officers concerned will accept the single building plans for the clubbed sites. And for the purpose of clarity and transparency, the clubbed sites will be categorised under two heads-CLUBS for SCO/SCF sites and CLUBB for booth sites, according to sources. Wheat glut, shortage of gunny bags, alleged indifferent attitude of procurement agencies and allegations of corruption aptly describe the situation in grain markets of Sirsa, one of the biggest contributors to the country’s food kitty. Polytechnics no longer appear to be popular with students seeking a career in engineering. For 3,900 seats in 10 polytechnics, including two government polytechnics, in this district, there are only 3,600 applicants forcing the institutions to extend the last date of submitting forms. The same is true of almost all other districts in Haryana. The Kurukshetra Zila Parishad has earned the distinction to find a place among 15 zila parishads in the country, after being selected for the Rashtriya Panchayati Raj Award for effective implementation of all rural development schemes and ensuring that the benefits of the schemes percolated in all 419 villages. INLd Secretary-General Ajay Singh Chautala today asked the Haryana Government to order a judicial probe into the incident involving Chief Parliamentary Secretary Ram Kishan Fauji leading to his hospitalisation. The Haryana Police today came under the Punjab and Haryana High Court scanner with the company managing the Delhi-Gurgaon Expressway project alleging that cops were allowing vehicles to pass without paying toll. Magsaysay Award winner and social activist Sandeep Pamdey has opposed the plans to establish a nuclear power plant at Gorakhpur village of Fatehabad district. Addressing the fourth annual session of the Sampuran Kranti Manch here yesterday, he said most of the developed nations had already dumped this technology as such plants posed several dangers to human population. The Education Department will soon recruit 25,000 teachers and a proposal to this effect has been sent to the Haryana School Teachers Selection Board, said Samir Pal Srow, Director, Secondary Education, Haryana, while talking to mediapersons here today. Satpal of Khewra village was allegedly murdered by an auto driver Manish and others with some sharp-edged weapons last night. The police has arrested Manish and another person of the village. The decision of calling off an engagement before a marriage proved costly for the family of the prospective groom here. The family was penalised with a fine of Rs 21,000 by a social and caste panchayat here recently. Nearly 38 lakh metric tonnes of wheat had been procured in Haryana mandis this season, a spokesman of the Haryana Food and Supplies Department said. The power supply to Panchkula town, Mansa Devi, Raipur Rani, Barwala and Madanpur will remain disrupted on |April 25 and 26 from 7 am to 6 pm and on April 27 from 10 am to 2 pm as the Haryana Vidyut Prasaran Nigam will take a shutdown for erecting towers for a 220-KV line near Raiwali village. The National Bank for Agriculture and Rural Development (NABARD) has sanctioned a project for construction of toilet blocks for girls in coeducational schools covering all 21 districts of Haryana. 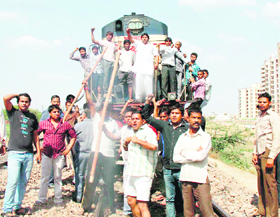 Chief Minister Bhupinder Singh Hooda has said the Delhi Metro would be extended up to Faridabad district. In a major relief to allottees of commercial sites across Haryana, HUDA has relaxed the policy on approval of building plans of clubbed commercial sites. Under the revised norms, the HUDA estate officers concerned will accept the single building plans for the clubbed sites. And for the purpose of clarity and transparency, the clubbed sites will be categorised under two heads-CLUBS for SCO/SCF sites and CLUBB for booth sites, according to sources. However, the respective zonal HUDA Administrator will remain the sanctioning authority for the clubbing of the sites.The HUDA Administrator will make sure that the application for the clubbing of sites must be accompanied by a certificate from a structural engineer so that the safety measures were not compromised. For the clubbing of adjoining commercial sites under different ownerships, the owners of the sites have to submit a joint application. While opting out of the clubbing by individual allottee is not allowed, individual owners have to sort out their disputes among themselves. The clubbing of commercial sites can be discontinued if the “clubbing partners” moved a joint application before HUDA. The Haryana Government had allowed the clubbing of commercial sites for faster development of commercial areas. Since a single building plan is to be approved, the approval of building plans becomes faster and hassle-free. Traders in the Sirsa grain market today held a demonstration and raised slogans against the authorities in protest against their apathetic attitude . They alleged that owing to poor lifting of the purchased stocks, the grain market is blocked with wheat bags. “The contractor’s men demand Rs 2 per bag and even more for lifting purchased wheat and only those traders who pay up get plinths in front of their shops cleared,” alleged Gurdial Mehta, a former president of the Sirsa Grain Market Traders’ Association. “The situation is so bad that if a member of families of traders, most of whom have their residences on the first floors of their shops, have a medical emergency, it will not be possible to shift him or her to a hospital,” Mehta said. Traders alleged that the authorities knew it all but they preferred to look the other way for obvious reasons. Market committee secretary Madan Lal, however, claimed that lifting of purchased stock was normal but the problem had arisen due to heavy arrivals of wheat. Till Saturday, 18.44 lakh quintals of wheat had been purchased from mandis in Sirsa and heavy arrivals were witnessed today. Farmers alleged that procurement agencies had been rejecting their wheat on flimsy grounds though the moisture content in the crop was within permissible limits. Meanwhile, procurement of wheat has been suffering at purchase centres in Panjuana and Alika due to non-availability of gunny bags for the past two days. Ram Singh, District Food and Supplies Controller, however, maintained that his department had enough stocks of gunny bags and these would reach the centres soon. 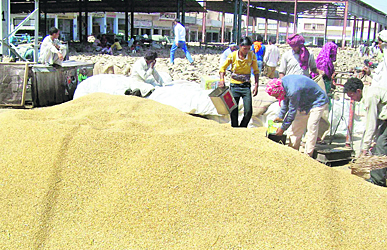 As in Sirsa, the grain markets in Fatehabad, too, are flooded with wheat. Heaps and bags of wheat can be seen in the residential areas of Model Town, Green Park and the vegetable market, besides the local grain market. Figures available from these institutions reveal that 7,000 candidates had applied for admission to these polytechnics last year. The last date for submitting forms was April 16. However, considering that only 3,600 applications have been received till now, the authorities have extended the deadline to April 30. Admissions to polytechnics are made on the basis of a qualifying examination called the Diploma Entrance Test conducted at the state level. This means that even if all applicants passed the examination, there would still be 300 seats left vacant in the institutions in this district alone. 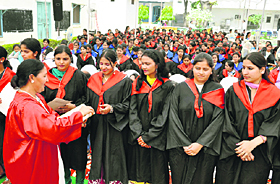 Sudhir Kumar Verma, a teacher in a polytechnic, said there were two main reasons for the lack of enthusiasm among students to get admission to polytechnics. Firstly, there were fewer seats available for them in engineering colleges through the lateral entry scheme. Under this scheme, those passing out of polytechnics can seek admission to the third semester of B. Tech course. But with the number of seats being fewer, students prefer to join engineering colleges directly after passing the 12th class examination. Another reason was that most students seeking admission to polytechnics came from rural schools where the medium of instruction was Hindi. In polytechnics the medium of instruction was English which the rural students found hard to cope with. Dinesh Goel, a student who has applied for admission to a polytechnic here, said jobs were not a problem for those passing out of polytechnics. Most students were placed properly before the results of the final examination were out. However, he said, most diploma engineers realised that they needed a degree for better career prospects. So, they prefer to join an engineering college directly. The Kurukshetra Zila Parishad is the only zila parishad in Haryana to have been selected for the award on the basis of 100-point questionnaire, chairman Praveen Chaudhary said. The award would be presented at a function being organised at Vigyan Bhawan, New Delhi, tomorrow. The point-wise replies to all 100 queries were sent to the centre, which conducted a survey of the villages on the basis of the replies in December 2011 and February 2012 and the selection was made after proper evaluation. The Kurukshetra Zila Parishad implemented the policies of the government with the cooperation of the panchayat, zila parishad members and the district administration and its performance in the areas concerning the welfare and empowerment of women and children, upliftment of poor and farmers and proper utilisation of grants was rated high. All 419 villages have been provided safe drinking water, 250 villages have been conferred the Nirmal Gram Award for sanitation, 100 per cent complaints were redressed and dairy farming and floriculture schemes were properly implemented. Chowdhary said the zila parishad had made it mandatory for all ward members to attend the meetings and the proceedings of the parishad’s meeting would be video-graphed from the next meeting. Addressing mediapersons here, Chautala said the probe should be conducted by a sitting judge of the Punjab and Haryana High Court to ensure that the government did not influence the outcome. He said a CD had been doing the rounds in the Bhwani area which pointed to the possibility of a scandal on the lines of the recent Bhanwari Devi case in Rajasthan. He said there was a real possibility of its link between the murder of a person in Pehladgarh village in Bhiwani district. A month has passed but the killers were yet to be apprehended. Wishing Fauji an early recovery, he said truth must come out and it should be determined whether Fauji had attempted suicide or it was an attempt to murder him. Chautala said the deployment of a large number of Haryana policemen and CID sleuths at the hospital where Fauji was being treated also indicated that there was something fishy . He said he had a copy of the CD in his possession and if the government did not order a probe, he might as well release it in the public interest. Directions were also sought by the company to facilitate it ‘in implementation of the Delhi-Gurgaon Expressway project by providing dedicated police teams to assist in collection of lawfully authorised toll, to ensure safety and security of life and property, and to regulate traffic at the toll plazas. He said the movement against the plant was fully justified and every right-thinking citizen of the country should oppose the setting up of such power plants. He said he would actively support the movement against the plant launched by the villagers. Pandey said saving democracy in the country was of utmost importance as foreign companies had established bases here and these posed a threat to the continuance of democracy in India. Former HPSC member DR Chaudhry said the prevalence of inequalities in a state where the freedom of expression was under a cloud could only be imagined. He said it was necessary to guard the freedom of expression to protect democracy. Manch convener Yogendra Yadav said the organisation had done its bit in keeping hopes alive for emergence of a new Haryana bereft of opportunism, casteism and regionalism. Srow said the government would spend Rs 8245.58 crore in the current financial year under plan and non-plan schemes, which was Rs 1369.59 crore more than that in the previous financial year. Under the Right to Education Act, the government had also notified the Haryana Right of Children to Free and Compulsory Education Rules-2011. He said to provide quality education to children, training was being imparted to teachers. A national-level teachers’ training institute would soon be opened at Silanikeso village of Jhajjar district. The victim’s headless body was recovered from a water channel near Sanpera village this morning. However, the head, which was reportedly thrown in the bushes near a dhaba on the GT Road between Gannaur and Murthal has not been found. In another incident, the bullet-riddled body of Sanjay of Taherni village in UP was found lying in a room in the fields of Aterna village in the district last evening. social and caste panchayat here recently. It is learnt that the matter came up for the hearing before the panchayat yesterday when the family of the prospective bride, which hails from Safiodon Kheri village lodged a complaint that the family of the boy had called off the engagement that took place on April 16. The boy’s family resides in Vijay Nagar locality here. The panchayat announced that the decision to break the alliance at this stage was wrong and it had caused inconvenience and embarrassment to the girl’s family and the accused family ought to pay the fine as a punishment. Around 37.99 lakh metric tonnes of wheat had been procured by six government agencies and the remaining by traders, he said. Over 11.02 lakh metric tonnes of wheat were purchased by the Food and Supplies Department and over 11.99 lakh metric tonnes by HAFED. K Sayeed Ali, Chief General Manager of the bank, said that 6,095 toilet blocks would be constructed in 2,910 schools to improve girls' enrolment. It would benefit around 4.50 lakh girl students and the school dropout rate was expected to come down. He said there was a plan to extend the Metro up to Ballabhgarh town in the district. Out of a total expenditure of Rs 2,500 crore, the state government had given more than Rs 1,500 crore for this purpose. The city will soon have a modern facility for packing, ripening and preserving fresh fruits without the use of chemicals like carbides and gun powder. A pack house with ripening chambers and cold storage facilities is coming up in the Mill Gate area here and is expected to be functional in about two months.